FYI: this press release for a local program of interest for the Houston-area genealogy community. The Bob Lutts Fulshear/Simonton Branch Library is part of the Fort Bend County Library System. Cemeteries can be a wonderful source for local history. Stories and clues about a town's early days and the people who settled the area can be gleaned from gravestones and historical markers that provide a glimpse into the past. Hear about the Fulshear-area's history at a special program, "Fulshear's Final Resting Places," at the Bob Lutts Fulshear/Simonton Branch Library on Thursday, October 18, beginning at 6:30 pm, in the Meeting Room of the library, located at 8100 FM 359 South in Fulshear. Ken Stubbe, a member of the Fort Bend Historical Commission, will talk about the historical Fulshear cemeteries, including where they are located, who is buried in them, and the stories behind their origination. Learn about what can be done to help preserve these repositories of local history. Stubbe has been a member of the historical commission since 2011, and was part of the team that got the Fulshear Black Cemetery designated as a historical site. The program is free and open to the public. For more information, call the branch library at 281-633-4675 or the library's Public Information Office at 281-341-2677. The Clayton Library will be holding its Family History Book Sale in October. All Clayton's duplicate family history books will be available for sale. These are donated books that we already own; the copies offered for sale have never been part of our collection. "My Civil War Ancestor in the Rock Island POW Camp"
Special presentation by the Montgomery County Genealogical and Historical Society. Registration not required. 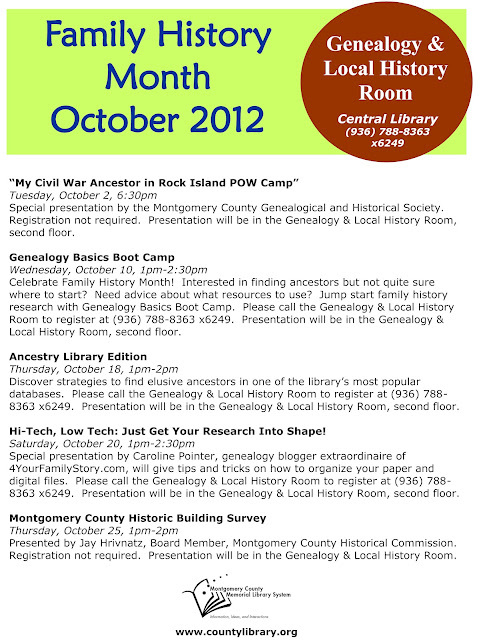 Presentation will be in the Genealogy and Local History Room, second floor. ILL - Interlibrary Loan? What's that? Interlibrary loan allows you to obtain research materials from libraries outside the Houston Public Library system. HPL implemented a new interlibrary loan system about a year ago. Learn about this free service offered to increase your research sources. Reservations required. Please call 832-393-2600. Adults/Teens. Interested in your family history, but not quite sure where to start? Found some information, but need to know what else is available? 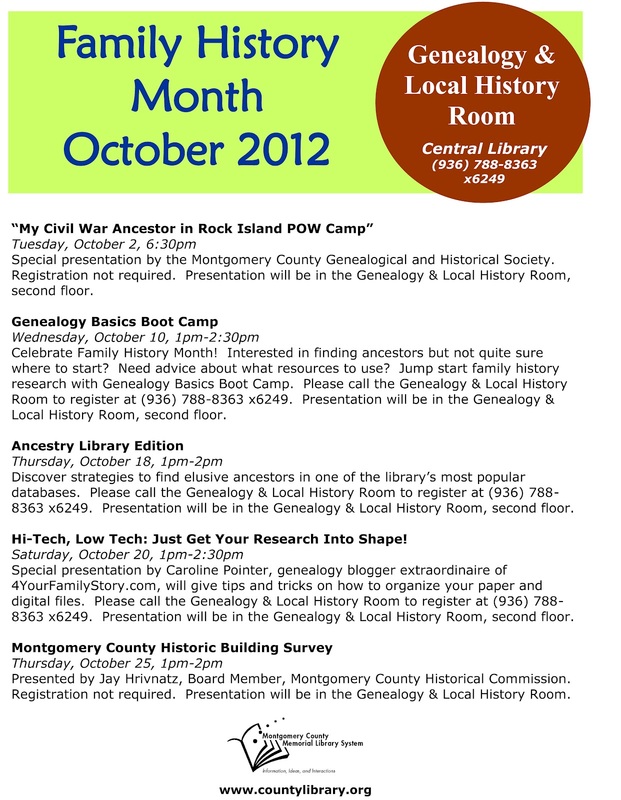 Join the boot camp for an exercise in genealogical research resources! This session focuses on starting genealogical research by examining basic tools, such as the pedigree chart, and basic research strategies. Learn about the different genealogical materials available to researchers and how they lead to other sources. Reservations required. Please call 832-393-2600. Adults/Teens. Since the discovery of the New World, ships have been bringing passengers to our shores to start new lives. Some of these voyages were well documented and some not. In this talk we will be discussing how to find evidence of your ancestors on passenger lists. Reservations required, please call 832-393-2600. Adults/Teens. Interested in finding ancestors but not quite sure where to start? Need advice about what resources to use? Jump start family history research with Genealogy Basics Boot Camp. Please call the Local History and Genealogy Room to register at (936)788-8363 x6249. Presentation will be in the Genealogy and Local History Room, second floor. Do you have German roots but are unsure about how to get started researching records outside the United States? Are you trying to find the town of origin from which your ancestors came, and what records are available for that town? This session deals with basic-level German research, with a focus on church and civil records and how to find them and use them. Reservations required, please call832-393-2600. Adults/Teens. This presentation will feature case studies involving the Civil War pension files of two free men of color, Casimir SAM and his cousin Martin WHITE, who served in the 1st Louisiana Guard, later the 73rd Louisiana Colored Troops. Learn how valuable Civil War pension files can be in researching the lives and family history of your ancestors. Reservations required, please call 832-393-2600. Adults/Teens. Sources, Special Research Problems, Hints! Learn about several helpful research sources (online resources, South Carolina Archives, and collections in other repositories) and hints on organizing your research. Reservations required, please call 832-393-2600. Adults/Teens. Registration is not required. Event is in the meeting room. (281)360-6804. Event is in the training lab. (281)360-6804. Have you ever wondered why people use city directories in genealogy? Learn how they can be useful in your research, how to use them effectively and where they may be found today. Reservations required, please call 832-393-2600. Adults/Teens. Ken Stubbe, a former member of the Fort Bend Historical Commission, will talk about historical Fulshear cemeteries, including where they are, who is buried in them and the stories behind their origin. The program is free and open to the public. Presentation will be in the meeting room of the library located at 8100 FM 359 South in Fulshear. Discover the strategies to find elusive ancestors in one of the library's most popular databases. Please call the Local History and Genealogy Room to register at (936)788-8363 x6249. Presentation will be in the Genealogy and Local History Room, second floor. Click here for detailed information and registration instructions for this event. Learn about the vast family history research resources at this wonderful library. Registration is free and open to the public. Call (832)393-2600. Visit with representatives from many genealogical and historical lineage societies to discuss their organizations. Get some hints that can help you identify those ancestors for entry into those societies. Representatives include, but are not limited to, the Daughters of the American Revolution, Sons of the Republic of Texas, and Cherokee Nation. No reservations needed. Adult/Teens. Special presentation by Caroline Pointer of4YourFamilyStory.com will give tips and tricks on how to organize your paper and digital files. Please call the Local History and Genealogy Room to register at (936)788-8363 x6249. Presentation will be in the Genealogy and Local History Room, second floor. Learn how to create a family-tree website using the free resources on TribalPages.com. Those attending the class will need an email address to set up an account on this resource, on which users can add names and upload photographs, create an interactive chart, capture family stories and invite other family members to contribute information. Free and open to the public. Reservations required. Go to the library's web site, click "Calendar," select "George Memorial" and find the program. Participants may also register by calling the library's Local History and Genealogy department at (281)341-2608 or visiting the library. Learn about some very unusual record groups for genealogical research, sources not often thought of. Reservations required, please call 832-393-2600. Adults/Teens. Presented by Jay Hrivnatz, Board Member, Montgomery County Historical Commission. Registration not required. Presentation will be in the Genealogy and Local History Room, second floor. Meetings are open to the public. Everyone is welcome! An overview of some of the records you might find most useful when looking for your ancestor from England, such as census and civil registration records, parish registers and much more. Reservations required, please call 832-393-2600. Adults/Teens. Library staff will provide basic instruction to many of the resources that are available to the beginning genealogical researcher. Items that will be introduced include print resources, materials that are available on microfilm, and online tools such as Ancestry.com and Heritage Quest USA. Reservations required. Go to the library's web site, click "Calendar," select "George Memorial" and find the program. Participants may also register by calling the library's Local History and Genealogy department at (281)341-2608 or visiting the library. Today's mail included a copy of the October/November 2012 issue of Family Tree Magazine. I stood at the mailbox and flipped through the glossy pages of the magazine until I reached the familiar newsprint center that contained the city guides. This issue includes a city guide for Houston...and I wrote it. I am very proud of this city guide because it's time the 4th largest city in the United States got its chance to be in the spotlight. This city has a rich history and its records are of exponential value to genealogists. I also feel blessed that the Family Tree Magazine gave me the opportunity. If my paternal grandmother was still alive, I'd send her my copy of the magazine. She was a journalism major (Oklahoma A & M, Class of 1934) and talked often of her time at the Duncan Banner. She was the society columnist (sadly with no byline) until she married in 1937. That was the end of her journalism career. In the 1990's my grandma and I were both employed in the family business. One of my tasks was to write catalog copy. Short descriptions of many similar looking items. How many ways can one describe tan leather? I'd write the descriptions and she'd proofread and edit. As tedious as it sounded, she really did enjoy editing. We'd sit on the office couch and try to make 50 almost identical items sound different from each other. Sometimes my grandma would talk about her college paper and columnist days. Looking back now, I see this is where my writing ability came from. I'm the only one of six grandchildren to catch that bug, and I'm glad I did. I wish I'd asked her more about her brief journalism career. My grandmother passed away before I started researching my ancestors. Since then, I was given the all the family history writing that her brother did. I connected with her nephew who made a career in the newspaper industry. I also found that her great-uncle authored Early Days in Cooke County 1848-1873. Knowing the writing history of my ancestors makes sense of my own tendency to put words on paper, computer screen, website and even this blog. Since I can't give the magazine to my grandma, I'm going to give it to my mom. She can put it on the Coffee Table of Accomplishment. If you get Family Tree Magazine, I hope you enjoy the Houston City Guide (there's one for Ft. Wayne in there, too). Should your family history research ever lead you to Houston, do let me know so I can show you the genealogical sights and sites of the area. It's a great place to visit. As my first official duty as a RootsTech 2013 Official Blogger, I'm informing you that the early-bird registration is available now. Conference schedule including week at a glance, session schedule, and workshops. There's even a special Developer Day with its own developer schedule. Also, the Expo Hall is 40% bigger than in previous years. This is very good on many levels. You can never have too many family history and technology vendors...and there's plenty of room for books! And of course, don't forget the special evening events. Registration for RootsTech 2013 depends on which track you want to attend (day pass, full conference, Developer Day, Getting Started). There's even a reduced price for students. UPDATE: if you're registering for the 3-day conference, use code RT129 and save $20 off the early bird price of $149. Hurry because this super special discount ends October 12, 2012. And....don't forget....the Family History Library is just around the corner from the RootsTech venue. I bring you this information as part of my Official Blogger duty, but also because I enjoy RootsTech very much. It has some of the tech talk I crave and miss from my library conference days. It has a beautiful setting. It has lots of genealogy sights and sounds. It has excellent speakers. It has old and new friends. 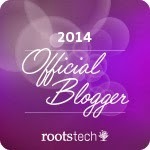 Who is an Official RootsTech 2013 Blogger? This Girl! I am very, very excited to be picked as an Official Blogger for RootsTech 2013. The invitation came this weekend and I did little genealogy cartwheels when I read it. What does this mean for you? Information about RootsTech leading up to the event. Then recaps from RootsTech during the conference. No worries if you can't make it to Salt Lake City. They'll be streaming some of the sessions, just like previous years. Who else is going to RootsTech? I look forward to hanging out with my genealogy friends and blog readers. [Disclosure: I received a complimentary registration for my role as an Official Blogger for RootsTech. The excitement, however, is my own. REGISTRATION IS NOW OPEN for the Texas State Genealogical Society’s 2012 Annual Conference, “Saddlebags to Social Networking: Following Ancestors Through History,” November 1- 3 at the Riley Conference Center in Fort Worth! This year’s featured speaker is Curt Witcher, who heads one of the top genealogical research libraries in the nation, the Allen County Public Library’s Genealogy Center in Fort Wayne, Indiana. **Thursday** is Free Learning Day. Develop genealogical society leadership skills or learn how librarians can better serve genealogists. Also free on Thursday are two identical half day sessions on using FamilySearch.org. **Thursday Night** is our completely free “Best of the Southwest” Genealogy Expo where sellers of genealogical books, services and supplies will be open for business. You’ll also visit with representatives of many genealogical, lineage and historical associations. **Friday** is the first of two days of concentrated education where many of Texas’s best genealogical speakers will present topics as varied as scanning and sharing family photos, Native American research, DNA, immigration and courthouse records. Friday continues the free half-day session on FamilySearch.org, plus something not seen before—a free "Getting Started" track that will help novices begin their research. Friday night is the highly anticipated Banquet with nearly $3000 in Awards granted after Lloyd Bockstruck, this area’s iconic source of genealogical wit and wisdom, entertains us with “A Black Chicken Lays White Eggs”. **Cost** We’ve reduced registration fees substantially from past years. Full conference registration, which includes lunch Friday and Saturday, is $60 with a $10 discount to current TSGS individual or family members (TSGS membership is available on the registration forms. Benefits of membership can be found at www.TxSGS.org). You’ll want to sign up for the Banquet and purchase a hard copy of the Syllabus (free in digital form to all registrants.) If you’re attending a free session, you may order lunch. You must register to be entered in the daily door prizes drawings. Societies struggle because they need to move forward. Morgan noted that about 2% of the genealogical and historical societies out there do not have websites. The necessary tools for the 21st century are dynamic websites (no stale pages, lots of updates), blogs, green publications (e-newsletters, etc.) and technology and innovations along these lines. To attract new genealogy society members, offer a combination of traditional and technology programs. Supplement in-person speakers with webinars. Also form special interest groups (SIGs). These could be based on research interests like world locations, ethnic groups, software or technology. Morgan also urged societies to reach out to and work with other community organizations. He suggested a "Research-a-Rama" as a way to partner with local libraries. Members and community guests can learn about the society, the library's materials and some new skills all in one event. Other ways for societies to connect with the community include getting involved with schools, scouts, community groups (Rotary, Elks, etc. ), ethnic groups and more. Also, partner with other societies for larger events and programs, bigger profile speakers and to reach a larger audience. Be sure to advertise each and every genealogy society event though a variety of channels. There are lots of free community papers out there, events boards at community centers and libraries, and even television and radio. Takeaways from this session all pointed to increased community involvement for a society's success and growth in the 21st century. It's time for another round of "Fun with Search Terms!" People type certain words or phrases into search engines. If the combination is right, my blog turns up in the search results. Sometimes the searches are funny. Sometimes I can provide more information to users, if only they'd comment on my blog. Either way, I enjoy the process. Please note that these searches are anonymous so I don't know who is stumbling on my blog. I just comment in the hope that they find it again. Now on with the show. Actual search phrases are in bold. Someone really wants to get out of work because there were several similar search phrases and the person kept coming back to my blog. I have no idea why. Do you really need a form? Break out your genealogy research and show how you're connected to the deceased. Of course, that is assuming you're really going to a funeral and not just trying to get out of work. Translation: "My grandmother is/was a member of the Daughters of the American Revolution. I would like to speak to someone in this group. Where should I start?" First read the "Become a Member" page at the DAR website. Then look up a chapter near you and contact them. They will answer all of your questions and assist you in the application process. Good genealogical records Luxembourg because generous indexing FamilySearch.org. The wizard of RootsMagic is very approachable. If you send an email addressed to him via their contact page, it will be read and directed to the right person. I promise. Sounds like you have it down. Nothing for me to add. Does Iowa have waterfalls? I thought it was a flat state. Also, how the heck did this search land on my blog? Funny, I just attended a session about this at FGS2012. The biggest takeaway was that you should ask your members what they're interested in hearing and seeing. Here is my recap from the session. Are you looking for ideas? I'm going to assume so. It's best to hold general programs because your audience is so varied. Highlight the materials and databases in your library. Show patrons how to use your catalog and relevant databases (including newspapers). Basic tech instruction is great, too. Genealogists would benefit from digital camera instruction, how to blog, easy website building, writing and publishing family history, how to use an e-reader (and then promote your genealogy titles), and more. The ideas are endless. When all else fails, ask your patrons what they want. Now THAT sounds like a fine place to get an education! Thanks for playing! See you next month! In order to get the speakers your society wants, you have to ask the members what they want. Fogarty suggests that we gather this information several different ways such as surveys, meeting interviews or email. Society programs should reflect members' different research needs, levels of experience, locations of interest and time frames. Do not rely on one speaker for multiple sessions throughout the year or your audience will become complacent. Fogarty also addressed the speakers' needs from societies. She says that speakers depend on societies to promote events (though I know speakers that prefer to promote themselves. I prefer both.). Societies must have a good venue and good equipment. Speakers do talk among each other about good and bad speaking experiences. You don't want your society to get a negative reputation. Fogarty stresses that societies must understand all the time, money, travel and effort that goes into a genealogy presentation even before it is shared with the audience. Compensation should reflect that. Do you want to book a nationally-known speaker for your event? Plan ahead. Way ahead. National speakers book at last a year in advance and often more. If you're stuck for new speakers, check colleges, webinars, and the Genealogical Speakers Guild. Also consider the online lectures available at FamilySearch. On Wednesday, August 29, 2012, I attended the Plenary Session of the Federation of Genealogical Societies annual conference in Birmingham, Alabama. The event was sponsored by findmypast.com. Curt Witcher shared about the Preserve the Pensions project and encouraged donations to the effort. D. Joshua Taylor of findmypast.com was the Plenary Session keynote. The topic was "Transforming Your Society into a Dynamic 21st Century Destination." Taylor challenged each audience member to envision his/her society as a destination. He used hotels, inns and lodges as examples. How is your society perceived from the outside? Is it a fancy high-end hotel? A comfy small inn? A dump? Or a mishmash building that's not well defined? How is your society perceived within the community? Do they even know you exist? Taylor stated that societies must be present in their communities. They can do this through participation in local events. This includes volunteer service and charity. It doesn't always have to be about advertising and marketing your society. Add value to the community and give back. It will raise local awareness of your organization. Taylor also stressed how important it is to associate with hotels, restaurants, libraries, etc. Your society should be a front-line resource for genealogy tourism. You should be the foremost source for local historical information. Reporters and local media should know who you are and come to you first when they need the facts. Is your mayor aware of your society? Are your government representatives? Share their family history with them so they can experience the joy of knowing one's roots and appreciate the need for records access. Support your local libraries. Hold combined research and genealogy events open to the community. Have a variety of programs and activities for new and experienced members, as well as those just curious about genealogy. If your society is declining in membership, don't ignore the numbers. Those people didn't quit genealogy, they just quit your society. Reach out to them and ask why they left. Accept their feedback in a positive and constructive manner and use it to make improvements. 1. Get out in the community. 2. Anticipate future developments. Your society should be in a position to ACT, not just react.